Lorna Vincent wanted to die. She had experienced a steeplechase jockey's worst nightmare in 1986 in her native England. Her mount failed to clear a jump and somersaulted in mid-air, planting the rider into the turf head-first. Vincent immediately lost all sensation from the neck down. Even as doctors and nurses tended to her at the hospital, she could not bear to think of the future. Doctors clung to the hope that sensation might return as her body slowly recovered from the severe trauma caused by the accident. Approximately 24 hours after her horrific fall, she began to feel a tingling in her fingers and then throughout her lower body. Two weeks later, she was back in the saddle, back in a world that continues to mean everything to her. She developed a feel for horses because her parents, Jean and Peter, operated a riding school in Reading, England, when she was a girl. She became the first woman in her native country to be licensed as a professional steeplechase jockey and produced a 15-year career despite encountering initial stiff resistance in that male-dominated realm. Vincent came to the United States in 1995 to work for highly-respected trainer Jonathan Sheppard, a member of the National Museum of Racing Hall of Fame. She was supposed to return to England after six months. She never did. She wound up taking a new path as an exercise rider. Her name changed as well after she married Mark Chavez in 2003 and took his surname. 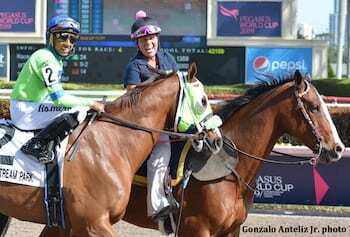 She also goes by “The Pink Lady,” due to her love of all things pink, as she splits the year between Gulfstream Park and Saratoga Race Course. Her riding ability, her work ethic and her knowledge of horses have endeared her to many a trainer. Chavez, 59, is assigned fillies most of the time. “The big boys can take a mickey on me half the time,” she said. Translation: They might take advantage of her kindness by turning rambunctious. Chavez is as beloved as she is respected by those she works with. Chavez successfully works horses even though she admits she never developed a clock in her head to help her gauge pace. “I have no clock in my head, and that is not a good thing to say. But I get away with it,” she said. Well, she more than gets away with it. When Chavez is not galloping or working horses in the morning, she is ponying runners to the starting gate in the afternoon. She sports bruises everywhere to prove it. She admits that she at least occasionally plays as hard as she works. She pleads guilty to partying to the point of exhaustion during her first Saratoga meet, sometimes arriving at Sheppard's barn in her fancy attire from the previous evening. Mark, her husband, works part-time for trainer Todd Pletcher and is a member of the starting gate crew at Saratoga. He has encouraged his wife to reduce her schedule in a slight concession to age. She will not have it. “I just choose a bit more because I like to work,” she said. Chavez dismisses any notion of retiring. “What on earth would I do?” she said. She briefly considered purchasing a tiki bar in the Bahamas three years ago — only to have the decision made for her when a hurricane swept the bar away. Chavez endured another bad fall in 2016. She was coming off the track at Gulfstream Park when two geese began fighting over a scrap of food. Her mount spooked and took off, dumping her on concrete. She fractured her right hip. Chavez needed to convince potential clients that the accident was a fluke, that she was as safe a rider as she had ever been. Chavez would not be denied. “The Pink Lady” is back, busy as ever and doing what she loves. Tom Pedulla wrote for USA Today from 1995-2012 and has been a contributor to the New York Times, Los Angeles Times, Blood-Horse, America's Best Racing and other publications. 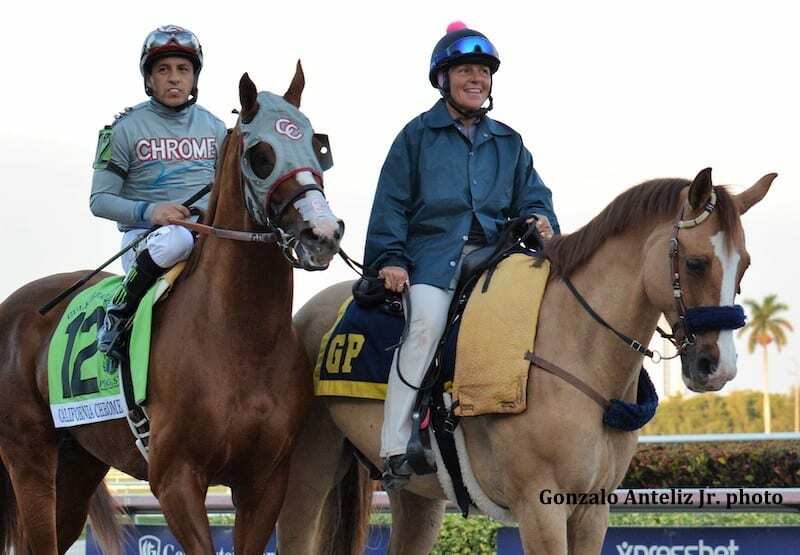 This entry was posted in In Their Care, NL Article, People and tagged exercise riders, gulfstream park, Horse Racing, In Their Care, jonathan sheppard, Lorna Chavez, Lorna Vincent, Mark Chavez, Michael Tomlinson, saratoga, todd pletcher, tom pedulla by Tom Pedulla. Bookmark the permalink.